People almost never ask me if I will leave Costa Rica, but they really should. As upwardly mobile as society is, nothing is ever set in stone, and I’m no exception. I’ve cliff-hanged about my intentions of staying in Costa Rica many times. But no matter how many times I’ve wanted to stay, something has always come up and forced me to leave. Recently, I was put on the spot by a visiting colleague of mine from the United States. It was her first time to Costa Rica, and she decided to come visit me and my family her first night here. She started with a softball: So how does a twenty something year old gringo end up in tropical Costa Rica? 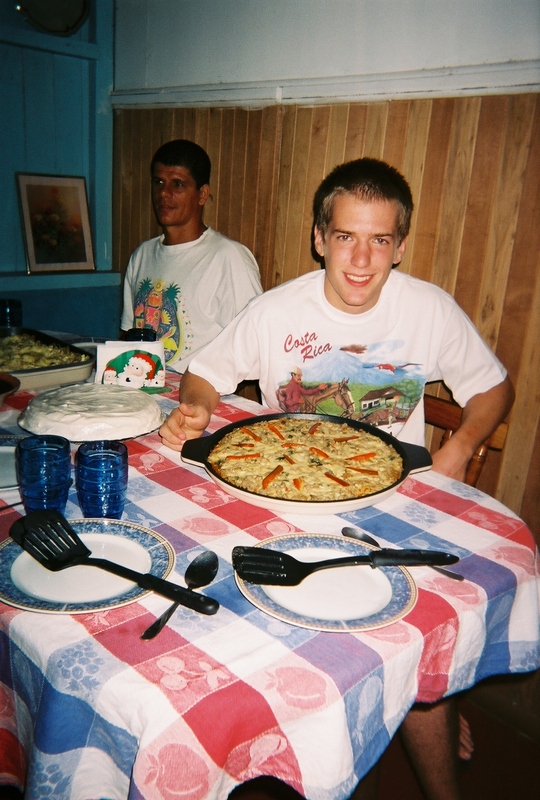 They even have pizza in Costa Rica, what’s not to love? girlfriend, started a business and married my girlfriend and rode off into the sunset. It was my best explanation yet. It included all the highlights, the tense, do-or-die deal-breaker moments and the realization of my new life. Had I had a pen and paper, this would have been the first draft of my autobiography. I was mildly startled by the question. “What kind of question is that?” I thought. “Of course I plan on… I mean in a few ye-ye-years… This will all… eh, eh… When I get a job with CEO pay!” I finally blurted out to dodge the question. I didn’t know why that was so hard to answer. I should have been prepared. Wondering why I wasn’t kept me thinking the rest of the night. I came to the conclusion that it was quite a loaded question. Had I planned to go back, I couldn’t expect people to think what I’m doing here is serious. It would seem this almost 10-year voyage that led me here would be for nothing. And if I didn’t go back, would I be running from the American dream? I’ve never thought much of what other people think of me, but this was heavily influencing my answer. How I answer might cause people to form a different opinion about me. The question reminded me of a couple I met once in Costa Rica. They had been married for 15 years and had no children, and every year they are still asked about having children. They had no children because they didn’t want any – and I’m sure they decided that a long ago and that it is a non-issue for them – so I imagine they, too, are caught off guard when the question comes up. I wonder if they ever make up an excuse just so people won’t think it is so different. Maybe that should be my strategy, too. Maybe what I am doing is a little too off the norm and people unconsciously assume this will all end. Well, here’s one reason that’s a faulty assumption. From 2004 until 2013, I never had a single address for more than 10 months at a time. Whether I was at college in Minnesota, teaching English in Spain, riding out the recession at home or traveling throughout Central and South America, I never had any intention of settling down. So you would think that now after over more than two years in one place and one year of marriage I would be itching at the sides to make a change, if only to go back to the United States. But that thought has never really crossed my mind. I still travel back a few times a year, and I have a place here for my parents to stay whenever they want to visit. Plus, with technology, a video call is never more than a moment away. If I do get lonely there is more than enough family to go around. Over the years, I’ve been “adopted” into many families and married into one whose family tree is bigger than a sequoia. I don’t know in what moment the question became irrelevant but other than in the CEO salary scenario, I think I am pretty well settled in. I’m sure now she doesn’t even recall asking me that head-scratcher in the first place. Maybe that is why no one really asks. Spend any amount of time here and you’ll forget you had that question for me in the first place.